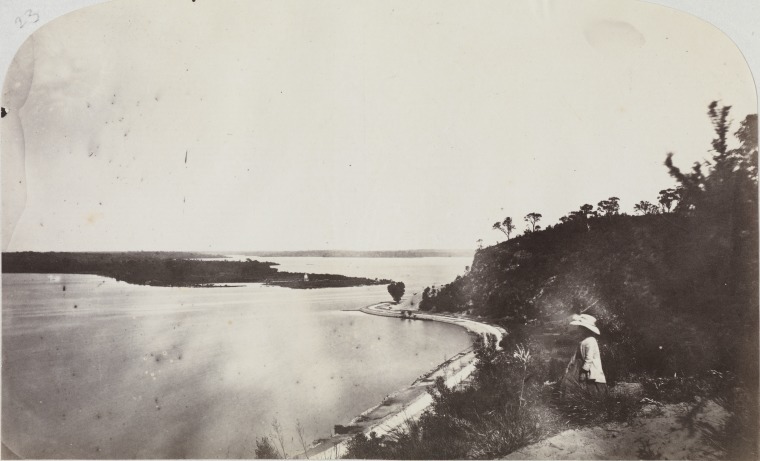 A fascinating album of some of the earliest photographs of Perth has recently been digitised and made available through the State Library catalogue. The photographer is Alfred Hawes Stone who compiled the album for his daughter, Fanny, on the occasion of her marriage to George Hampton in 1868. Alfred Hawes Stone was born in Tunbridge Wells, Kent, England and arrived in Western Australia on the Caroline in October 1829. In 1831 he was issued a permit to practise law and this was followed by a succession of official appointments including Registrar of Births, Deaths & Marriages in 1841, making him Western Australia’s first Registrar. Together with his brother, Frederick, who followed Alfred out to the colony in 1831, he established a firm of solicitors originally called A H & G F Stone. Alfred eventually rose to the position of Attorney-General. The photographs capture scenes in and around Perth and Fremantle as well as images of family and other members of Perth society at that time. You can see Perth Town Hall during construction, the Pensioners’ Barracks, Government House, the Bishop’s Palace and more. Some images are delightfully informal, such as the one featured here with Alfred’s grand-daughter, Lizzie, in the foreground. It has been difficult to accurately date some photographs and some of the subjects are not fully identified. We welcome any further information you may be able to supply about individual photographs. This can be done by filling in the online form that appears once you click onto a photograph to enlarge it. If you are interested in reading more about Alfred Hawes Stone, there is an excellent book on him entitled Court and Camera: the life and times of A.H. Stone: a pioneer lawyer & photographer in Perth. Copies are available to view in the Battye Library (3rd floor) or may be purchased in the State Library Bookshop. View the Stone album of photographs of early Perth and Fremantle or alternatively go to our online catalogue and type ‘stone album’ under keyword and select State Library Pictures from the drop-down box. The first result is for the album and the other results are the individual catalogue records for each photograph. Many of these have additional information in the notes or summary. This entry was posted in Family History, Pictorial, SLWA news, State Library of Western Australia, WA history, Western Australia and tagged alfred hawes stone, alfred stone, photographer, SLWA Pictorial collection, stone, WA photographs by triciaf. Bookmark the permalink. There are some pretty interesting photos amongst that lot. I loved them with the only problem for me was being able to read some of the handwritten descriptions. Thanks for the chance to see these.